With 33+ years of experience, Kamal is the Chief Operating Officer for Publicis Communications overseeing Leo Burnett, Saatchi & Saacthi and Publicis Middle East for the UAE, Kuwait and the Lower Gulf. In his current role, Kamal’s priorities include the supervision of 260+ employees and more than 25 accounts, covering a broad spectrum of industries. His main responsibilities include setting and delivering against growth targets for the three agency brands, new business development, overseeing the recruitment and development of the region’s senior talent, management of client-agency relationships and, last but by no means least, maintenance of creative excellence and agency reputation with a vision-led focus. Prior to his current position, he spent the 18 years steering Leo Burnett in the UAE, Kuwait and Lower Gulf to further growth and success as the Executive Regional Managing Director for the same territory, after having held various other leadership roles within the group. Extending his experience outside of the MENA region, Kamal has spent time with Leo Burnett in the United States working on new product development for Kellogg’s, as well as having spent time in Canada. 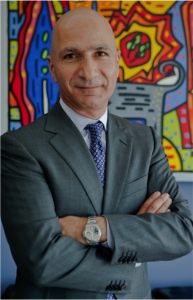 Kamal graduated with a bachelor’s degree in Chemistry in 1981 and an MBA in 1985 from the American University of Beirut. He has served as an adjunct instructor at the American University of Dubai, lecturing on integrated marketing communications and advertising. Beyond Publicis Communication and Leo Burnett, Kamal has been involved in the activities of the communications industry and has served on the IAA UAE Chapter Board sitting on two sub-committees. He has often written and provided commentary about industry topics. Furthermore, Kamal has served as an Adjunct Instructor at the American University in Dubai lecturing on Integrated Marketing Communications. Last, Kamal currently serves as a mentor at Endeavor, where he works with the leadership of various small-sized companies as they scale up and build further critical mass.